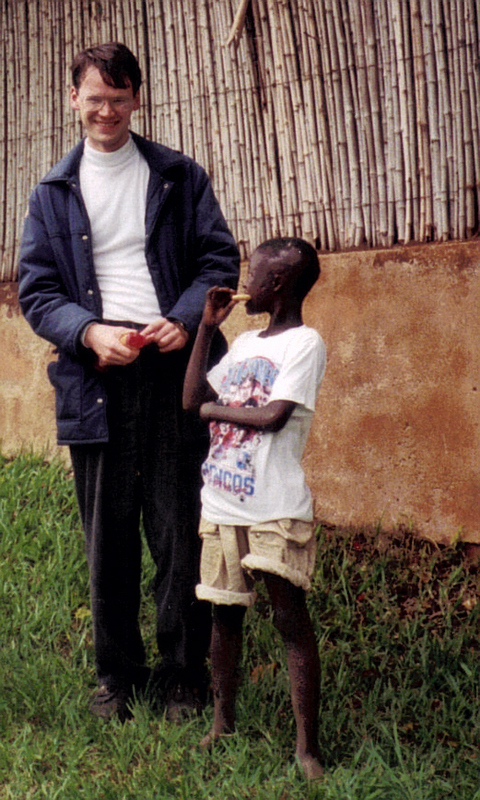 My own involvement in Rwanda dates back to July 1994, when I became the project co-ordinator for the Newick Park Initiative's new conciliation project. Rwanda was not a country that was well known in the English-speaking world at that time. It was originally colonised by Germany, and then mandated to Belgium after World War One. I had the task of researching as much as I could about the country's background, whilst also keeping track of current developments as the new government set to work. 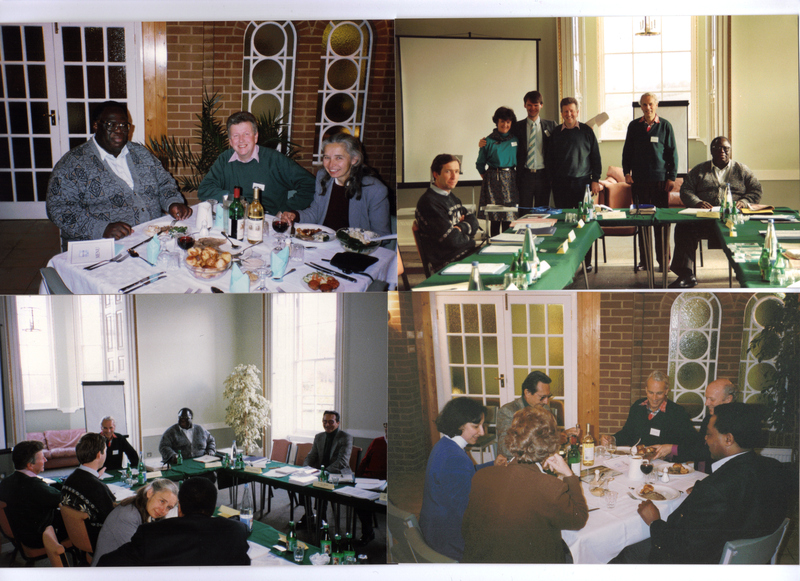 The first focal point for our work became a round-table conference which we organised at Ashburnham Place in Sussex in December 1994 with the title "Strategic Priorities for Development Assistance to Rwanda." The four photos above were taken at this event or at the follow-up event held in March 1995. Our Kenyan international mediator and executive director Professor Washington Okumu and a number of members of the donor community were able to hear from scholars, business people, missionaries, human rights workers, economists and others who had been closely associated with Rwanda for a number of years already. 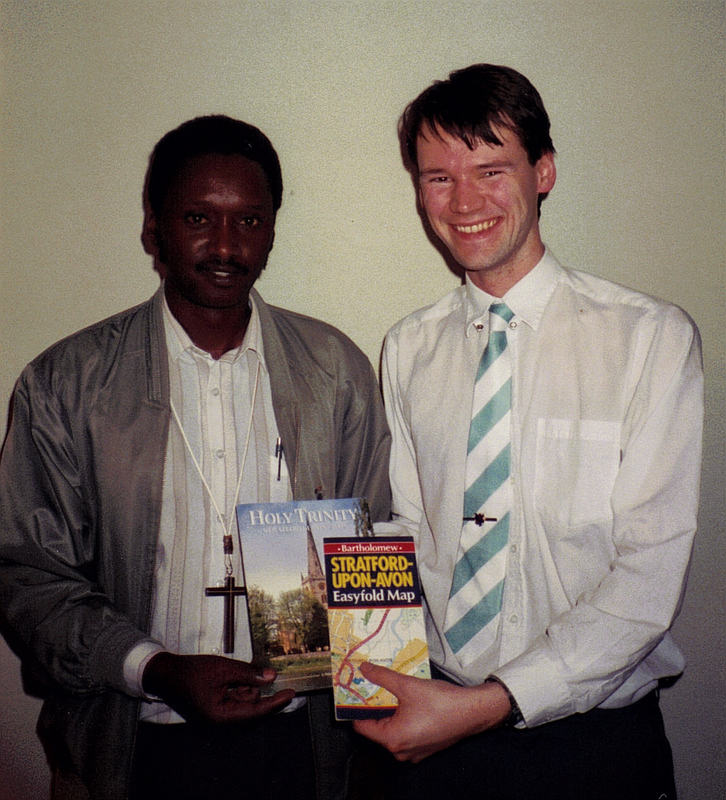 In between these two conferences at Ashburnham Place, Dr Michael Schluter, our Director, and I made our first visit to Rwanda in February 1995. We were greeted at Kigali Airport by Bishop Alexis Bilindabagabo, Anglican Assistant Bishop in Kigeme Diocese, who had been the first Rwandan I had ever met at the offices of Mid-Africa Ministry in London a few months earlier. Bishop Alexis had had a narrow escape from the killers during the 1994 genocide, and had set up the Barakabaho Foundation to support children left orphaned by those events. Also at the airport to greet us was the Anglican Bishop of Kigali, Jonathan Ruhumuliza. Bishop Jonathan was under some pressure at the time, because of statements he made on a foreign visit during the genocide to the effect that the then interim government was trying to restore peace and order. Our visit to the Anglican Cathedral in Kigali on Sunday revealed that there was deep resentment against the bishop amongst survivors of the genocide. This was symptomatic of a malaise in the country as a whole, as it had been difficult for anyone caught up in the events of 1994 to remain neutral, and thus anyone who survived and remained in the country tended to be seen as either a victim or a perpetrator. There were, however, a significant number of new arrivals in Kigali since the end of hostilities in July 1994. For them, the ousting of President Juvenal Habyarimana and his government, and the interim government that briefly took over from him, was the opportunity that they had been waiting for to return to their home country from exile. They had every reason to be happy, and sing joyful songs in church on Sunday morning. I was moved nonetheless that those who had borne the brunt of the horrors of 1994 could still join together in singing hymns like the one below.